Following a recent post about training in my forties, my inbox has been flooded with questions about injuries. 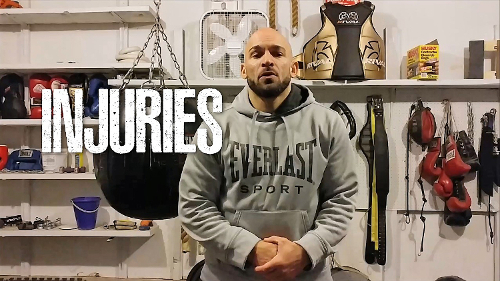 Apparently, many assume that I must be plagued by injuries based on how I continue to train at my age. Fortunately, that is not the case. I’ve been injury free for 20+ years. With that in mind, I have posted a follow up video where I share my thoughts on the subject. Injury prevention is a topic that I take quite seriously based on my own experience with injuries as a young athlete. I know the frustration and pain of being sidelined by injuries so it’s my hope that others can learn from the mistakes that I once made. Over the years, I’ve learned how to train effectively without beating myself up or running myself into the ground. In summary, there’s obviously no guarantees against accidents or injuries, but we can all be proactive by training intelligently to avoid mishaps. As I’ve said many times before, the goal of training is to become stronger and more resilient. There’s no glory in pushing through structural pain just to complete a workout. I train to improve myself, not run myself into the ground. If your training leaves you constantly beat up and fatigued, you are doing it wrong. Make a change on your terms before an injury leaves you with no other options.